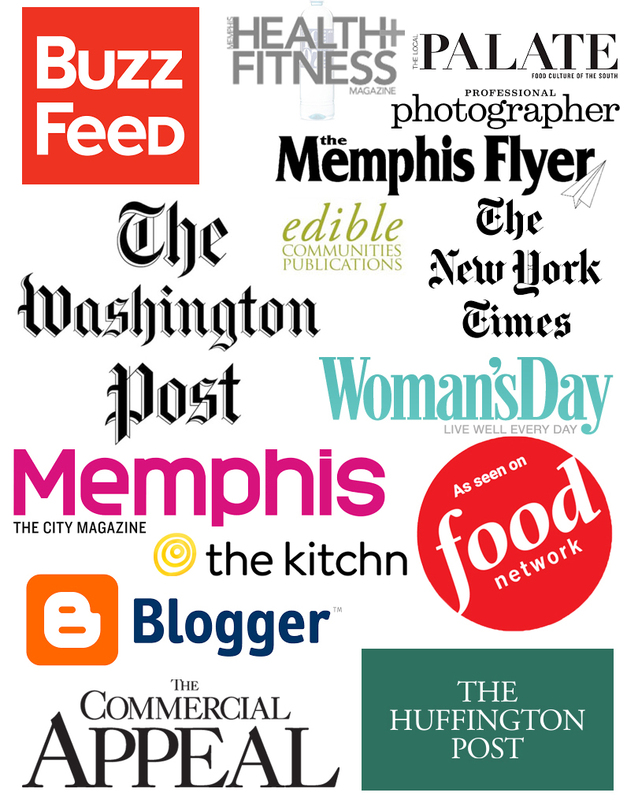 For the past 28 years, Soup Sunday has offered a chance for Memphians to come together and feast on creative soups from nearly 50 of Memphis's best-known restaurants. This year's participants, who are graciously volunteering their time and talents, include Amerigo, The Peabody, Huey's, Kooky Canuck, Hard Rock Café, Bardog, Babalu, Rizzo's Diner, Cafe Olé, and Say Cheese food truck. (Click HERE for a full list.) In addition to amazing soups, some participating restaurants may also offer appetizers, cornbread, cheese biscuits, and, of course, dessert. There will be several vegetarian options including pimento cheese from Hope Church, Apple Kiwi Kale Smoothies from Smoothie King, and Creamy Tomato Basil Soup from Stone Soup Café and Market. We also see some hints of our favorite vegetarian dishes on the list like doughnuts, ice cream, bundt cake, and coffee. We can't imagine you'd go home hungry. The Soup Sunday event has raised over a million dollars for Youth Villages and their programs. To celebrate, Youth Villages has given us a family pack of tickets (2 adults and 2 children) to this year's Soup Sunday so that a TCV reader can go for free. To enter, comment on this very Soup Sunday post before January 26th at 10 p.m. and tell us about your favorite soup. That's it! We moderate comments, so don't worry, we will post them a few times a day. (See the official rules below for more details). Check back with The Chubby Vegetarian blog on Friday, January 27th to see if you won. We'll leave your tickets at the ticket window at the FedEx Forum so you can pick them up the day of the event. Good luck -- and we'll see you at Youth Villages Soup Sunday! Official rules: No purchase necessary. The Chubby Vegetarian Soup Sunday Sweepstakes is sponsored by The Chubby Vegetarian blog. 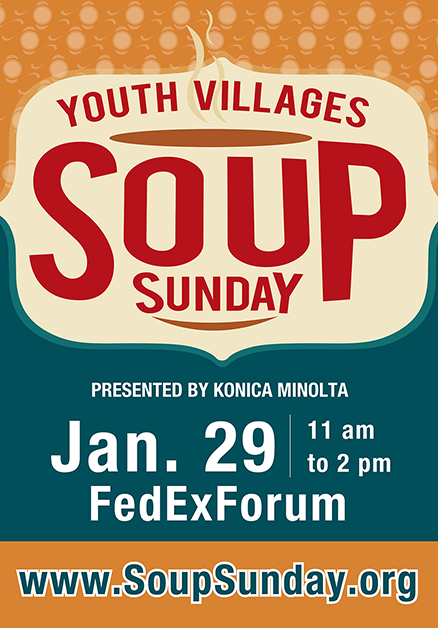 The featured prize is a package of 4 passes (2 adult, 2 kids) to the Youth Villages Soup Sunday event to be held in Memphis, Tennessee on Jan. 29, 2017; approximate retail value of the set of 4 tickets is $60. Winner is responsible for reporting the value of his/her prize where required. No other prize or compensation is included. Enter by commenting on this TCV Soup Sunday post and tell us about your favorite soup. 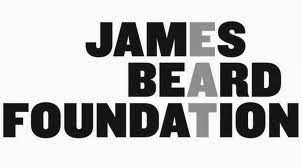 Eligibility requirements: entrants must be 18 years of age or over and reside in the U.S. Duration: sweepstakes starts at 6 p.m. CST on Jan. 24, 2017 and ends at 10 p.m. on Jan. 26, 2017. Deadline to enter is 10 p.m. on Jan 26, 2017. Open to individual U.S. residents aged 18 and older only; void where prohibited by law. The number of eligible entries received will determine the odds of winning. Only one comment per person will be considered; duplicate entries from the same entrant will be deleted. Winners will be selected by random number generator by 11 p.m. on Jan. 26, 2017 and announced by 10 a.m. on Jan. 27, 2017. If the prize is forfeited or unclaimed by 10 a.m. on Jan. 28, 2017, another entrant will be chosen by random number generator at that time and announced by 8 a.m. on Jan. 29, 2017. Tickets will be held under winner's name at the ticket desk on the day of the event unless other arrangements are made prior to the event. If technical issues require postponement of the selection of a winning entrant, an update will be posted on this blog post with updated information and deadlines. Winning entrant is responsible for paying any taxes related to the prize(s). TCV has the right to obtain and publicize the winner's name and likeness as well as require winner to sign a liability release. If there's one thing we love, it's a good collaboration. Over the past few months, we worked with our buddies Scott Tashie and Will Byrd of City Silo in East Memphis to create a brand-new TCV-inspired sandwich. It's called the Foxy BBQ Sandwich. (Get it? Inspired by Justin Fox Burks!) The Foxy BBQ is just one of the amazing new things on the City Silo menu, which includes tons of vegan and gluten-free options in addition to the fresh-pressed juice that you always ordered at Cosmic Coconut. Our recipe for the 'meat' of City Silo's dish is in our second cookbook, The Chubby Vegetarian. It's a variation of our Pulled BBQ Spaghetti Squash and our Spaghetti Squash Ribs, and some Purple Cabbage Slaw goes on top. We wanted to make something different from our usual Italian-style Stuffed Spaghetti Squash; we thought there had to be a variation that would work well. So if you want to know even more, check out today's video from Michael Donahue of The Commercial Appeal HERE; you can watch Will make the sandwich and then hear Scott talk about how it all came about. We got to be among the first to try the Foxy BBQ at a menu preview lunch at City Silo over the holidays, and we absolutely loved it along with all the other dishes and the inventive, healthy lattes and juices. Please let us know if you try this new Memphis spot or if you plan to order our new sandwich this week! We usually go out of town for like one night and just go non-stop for the day before and after. That's relaxation around here, at a crazy pace as usual. 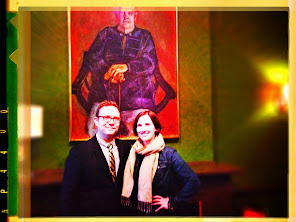 We've written about our time in NYC for fun and for our time at the James Beard House, Little Rock and P. Allen Smith's Moss Mountain Farm, Columbia, MS, and Valentine's Day in Oxford one year. One place we're always visiting is Mississippi, the state where both of us were born. Sometimes, we go for the quiet and to help do a little work in the family garden. We saw this amazing person perform there in November; we always go to Jackson and stop by High Noon; we finally went to Water Valley one Valentine's Day weekend; and we really love Oxford, which is a little over an hour away from Memphis. North Mississippi also has this now, which we can never resist, and it's right there on the way. We'd heard about The Graduate Hotel, and they had a New Year's Eve package that included little themed gifts and breakfast, so we finally decided to go. The deal seems to be that they just make everything as simple and effortless as possible, so nothing is a big deal. And it's adorable. Every design detail is so smart and knowing with an original point of view. We were set to go to dinner at Ravine, which is further outside of the square. Due to providing food photography a little while ago, we had a credit at Ravine, and we can't wait to go back and stay at the inn. The NYE menu there consisted of an amuse-bouche, 4 courses, wine pairing, and lime sorbet somewhere in-between. The vegetarian option included a first dish of roasted beet, goat cheese, and olive tapenade and then came local mushrooms and manchego on grilled ciabatta toast. The main dish was farro risotto with butternut squash, kale, and a fried egg. We also had a pear tart and chocolate cake. It was still Christmastime in Oxford, so when we got back to the square, we walked all around and looked at the lights and the big tree, people-watched, window-shopped, and also checked out the pizza oven at Saint Leo. We had breakfast, apple oatmeal, biscuits, home fries, and an egg-white and vegetable frittata, at Cabin 82 in the hotel and walked outside for a bit in the morning. We noticed pimento cheese and crackers front and center and ready to go at the gas station across the way. All of this was the best way to put 2016 away and start something sure to be even better in 2017. If you haven't been to Oxford lately, we think you would love it just as much as we do!